Blake Shelton Tries Sushi for the First Time and It’s Hilarious! This is priceless! Jimmy Fallon took Blake Shelton to Nobu during a segment that aired on The Tonight Show Tuesday, May 24 — and the reactions of sushi-virgin Shelton were totally hilarious! Evidently less than eager to chow down on a heap of raw fish, Gwen Stefani&apos;s current squeeze looked mistrustingly at everything — even the hot towel that was brought to him at the start of the meal. "That&apos;s a hot towel — don&apos;t eat it," teased Fallon. "It&apos;s not a sushi roll." The show host started his guest off on some sake. "It&apos;s rice wine," he explained before asking the 39-year-old crooner what it tasted like. "Easter egg coloring," he replied. 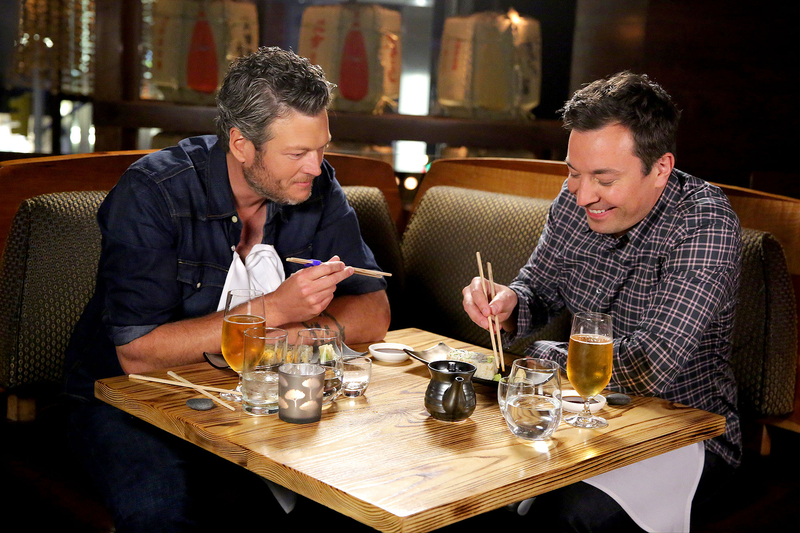 Fallon then took Shelton on a tour of sushi staples, from the pickled ginger ("kind of has the texture of pre-chewed gum," commented the country star), to sushi and onto sashimi. "This looks like human tongue!" he noted as he tried his first piece of raw fish. "The texture is Play-Doh, but I will say this, man to man, I like how that tasted." Not so for the yellowtail, however, and the sashimi barely made it into his mouth. As a grand finale (after quite a few more orders of rice wine!) the duo were presented with sea urchin. Or, as the waitress put it, "gonads of sea urchin." Surprisingly it was Shelton who proved bravest here, with Fallon almost wimping out entirely. Check out the hilarious video above and see how the show host rewarded his guest for being so daring!